This post is based on the article “Before the dominos fall: Regional conflict, donor interests, and US foreign aid“, forthcoming at Conflict Management and Peace Science. From the initial uprisings in 2011 through the present, the civil conflict in Syria has been one of the most complex and pressing international crises in recent memory. The United Nations estimates there are 13.5 million people in need of humanitarian assistance, with recent reports indicating that over 5 million people have fled Syria, with another 6.3 million internally displaced people. Ultimately much of the media coverage of the conflict has focused largely on 1) violence within Syria, and 2) the impact of Syrian refugees on the US and Europe. US policy towards Syrian refugees featured prominently in the 2016 US presidential race, with then-candidate Donald Trump taking an aggressive stance against taking in additional refugees. After the election the Trump Administration made its first attempt to actually implement this policy by barring entry of Syrian refugees into the United States (along with individuals from other Muslim-majority countries) shortly after entering office. Though these two areas are incredibly important, there is a middle ground that remains under-covered, and the focus on these two broad subjects has somewhat obscured our understanding of the conflict and its implications for countries in Syria’s immediate neighborhood. As noted above, a large number of the victims of the Syrian conflict have fled to neighboring countries, creating increased political and economic challenges on neighboring regimes. Further, the narrow, dichotomized focus on direct US military intervention in Syria neglects the many ways that the United States did respond to the conflict. In spite of the Obama administration’s position supporting the removal of the Assad regime, and the now infamous ultimatum regarding the use of chemical weapons, President Obama ultimately avoided any direct military intervention in the Syrian conflict against the Assad regime. What efforts there were to explore arming friendly Syrian rebel groups appeared to be marred by uncertainty and largely limited in scope. Instead, the Obama administration responded primarily by increasing economic aid to groups operating both in and around Syria. The Syrian case provides a useful contemporary example for thinking about how countries use foreign aid to advance their interests. It also helps to highlight the role played by conflict, geography, and proximity to conflict in determining aid flows. In many ways this is low-hanging fruit—the literature on the causes and consequences of foreign aid is one of the largest bodies of work in political science and economics, but there is surprisingly little work that focuses directly on how conflict shapes aid allocation patterns. To be clear, several studies of aid often control for conflict, but these are typically not the variables of chief theoretical focus. Similarly, there are studies that look at how aid—particularly, aid shocks—affect conflict onset. Scholars appear to have a sense that conflict matters, but have generally not focused on why, how, when, or where it matters. A 2008 piece by Eliana Balla and Gina Yannitell Reinhardt is one of a handful of articles to directly focus on the effects of armed conflict on aid flows. Balla and Reinhardt’s study shifts the focus toward the effects of conflict broadly speaking, and toward regional conflict more specifically, but the theoretical linkages between regional conflict and aid flows remain relatively vague. Furthermore, their results show that donor responses to conflict are not uniform, suggesting other donor-specific or donor-recipient-specific factors are at work. Accordingly, we remain in need of a clearer and fuller discussion of the theoretical mechanisms linking conflict with donor aid allocation decisions. This project builds off Balla and Reinhardt’s work by exploring three specific donor interest areas that we might expect to condition the donor state’s response to conflict in the region around a recipient state: 1) political ties; 2) security ties; and 3) economic ties. In short, conflict in the region neighboring a recipient state can have a number of spillover effects that can increase the demand for resources by recipient state governments. For the purposes of this post I stick with a brief discussion of just one of these areas. Conflict often creates massive refugee flows as citizens seek to escape the violence within their home country. The increased flow of people across the border can require increased manpower to process refugees and immigrants, as well as to strengthen policing along border regions, more broadly. There is also the risk that conflict will follow refugees across borders. It is not uncommon for fighters in one state to attack refugees as they flee across the border to a neighboring state. Where borders are less secure rebels themselves may seek sanctuary across a border, possibly inviting attacks from a neighboring state’s government. This, in turn, can risk escalation and possible direct military confrontations with a neighboring state. The spillover effects from conflict can negatively impact the interests of donor states in a variety of ways. For example, tthroughout the Cold War period and into the present, the United States has made the promotion of democracy a priority when allocating foreign economic aid. This goal was promoted partly as a response to the divisions that emerged during World War II and the Cold War, between the largely democratic bloc of Western European states and their fascist, and then communist, rivals. The belief that democratic states were more prone to cooperate and follow US leadership was also based on a long line of classical liberal thinkers from Immanuel Kant to Woodrow Wilson. More recently, John Ikenberry has argued that democratic institutions fostered a set of shared identities and ideas that made US leadership more legitimate. David Lake (2009) has also argued that democratic countries are more likely to honor the authority contracts they establish with the US, helping to stabilize and legitimize US leadership. Similarly, earlier work by Ashley Leeds and Lisa Martin shows that democratic states are more likely to cooperate with one another, and are more likely to honor international agreements. The spread of conflict to a friendly democratic regime may put that regime’s survival at risk. At the very least, increasing regional conflict may tax the resources of a client state, prompting the donor state to allocate more resources to the client to help them address the strains on their military and other government assets who are needed to respond to the externalities of conflict. So we’re left with a situation where 1) conflict can create externalities that increase the political, military, and economic stressors on neighboring states, and 2) donor countries like the United States may have reason to favor particular countries over others. The implication here is that, while the US may increase aid to recipient states help alleviate the pressures created by conflict in their neighborhoods, we ought to expect the US to provide larger increases in aid to more democratic states, all else being equal. Figure 1: Marginal effect of an increase in the level of regional conflict across the range of the referent state’s level of democracy. Figure 1 shows the marginal effect of an increase in the level of regional conflict around across the range of the referent state’s Polity score. For the most autocratic states we can see that there is an effect that is roughly equivalent to zero. 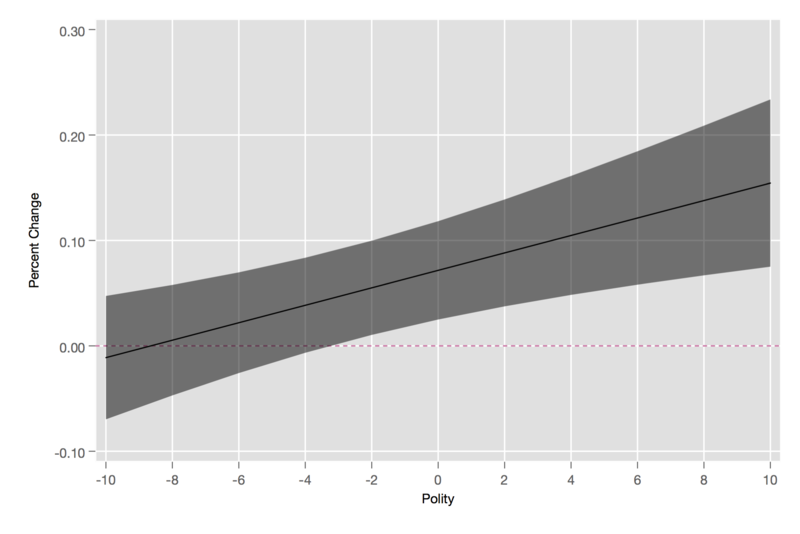 For states with middling Polity scores there is a positive and statistically significant effect that emerges. This positive effect becomes larger as we increase the referent state’s level of democracy. Substantively this means that the US generally increases aid as levels of regional conflict increase, but these increases are larger for more democratic states as compared to less democratic states. For the most autocratic states, however, we see little evidence of increases in the amount of aid the US gives in response to increasing levels of conflict. Two more points are worth noting. First, this is an abbreviated discussion of the different relationships that I analyze in the actual article, but we find similar patterns when we look at other variables, such as the referent state’s similarity to the United States as measured by UN voting patterns, the size of US troop deployments hosted by the referent state, and the level of US exports to the referent state. The closer the US is to the referent state, the larger the boost in aid that we find from increases in conflict in the region around the referent state. Second, as noted above, there have been several studies discussing the ways in which conflict can diffuse across borders. It is possible that local levels of conflict are shaped by the incidence of conflict in the surrounding region. However, the influence of regional conflict proves to be robust to a wide range of alternative model specifications. Ultimately there is more research to be done. Researchers can expand on this line of inquiry to answer a number of related questions. For example, how do different types of conflict affect aid flows? Does the intensity of conflict, in terms of casualties, for example, matter? Does the geographic concentration of conflict matter? Duration? Related to such questions, it is also worth asking what types of aid prove effective at curbing the negative externalities of conflict, and when. Given the volume of global foreign aid flows each year, and the greater flexibility that leaders have in deploying financial resources as compared to military resources, this is an area of great importance and policy relevance.